The planning for light rail to the North West is only in its early stages and many details and decisions have yet to be decided. One of the most important decisions will be the location of stations and how they interact with their local environment – e.g. a station that few can access, no matter how flash it is, will not be successful. The government have also made it clear they want to see housing and transport more intimately linked and to leverage off the big investments in PT they’re willing to make. With that in mind, I thought we should look at the potential station locations and some potential options for maximising the significant investment that will be made. To start with, let’s look at Point Chevalier, which I suspect might end up the busiest on the Northwest line. Let’s start with where light-rail is likely to go. Most likely this will be on the northern side of the motorway where there is largely a free corridor of land currently used for parking. Just behind the shops would make a great station location and would allow for strong connections between the two frequent Pt Chevalier/Carrington Rd buses (66 and Outer Link), as well as the 18 route along Gt North Rd. Obviously if the decided to keep light rail on Gt North Rd, which I don’t think is a good idea, the station would be in the middle of the town centre. Other motorway corridor locations, such as in the middle of the motorway or on the southern side don’t seem practical, especially once you consider how a line would have to thread through the Waterview interchange – another reason why it was incredibly stupid of the NZTA not to build a rapid transit corridor at the same time as the motorway works. The Unitary Plan on it’s own allows for significant development opportunities. The shops are zoned as a town centre with an 18 metre height limit (4 levels), with surrounding areas zoned Terraced Housing and Apartment Building or Mixed Use. Both zones allow development up to around 4 levels. 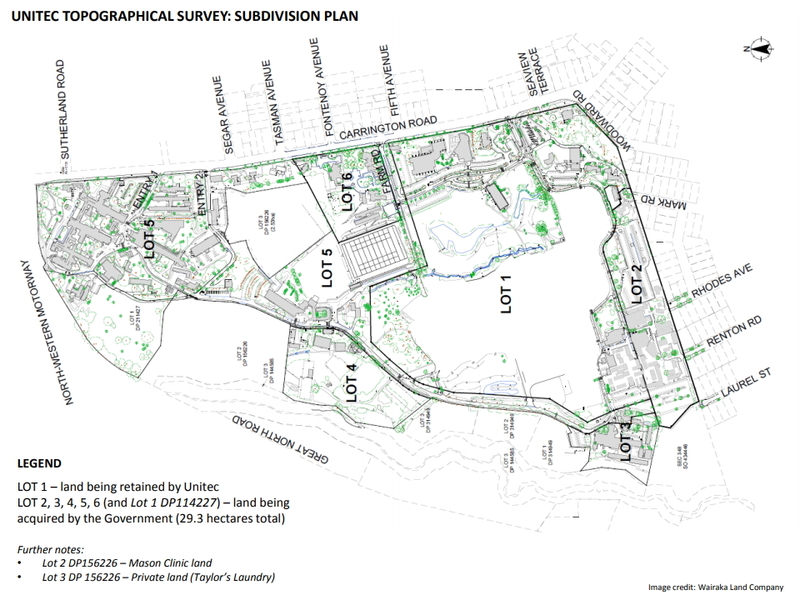 Then there’s the redevelopment of Unitec, on which the government want to build 3000-4000 new homes. When the Government announced it back in March, there was a lot of talk about how it will be integrated with the planned light-rail along the Northwestern Motorway. “We want this to be not just a housing development, but a strong and vibrant community. Twyford says the Government will build a light rail station at Pt Chevalier, that parts of the site are within walking distance of the Mt Albert train station and there are frequent buses to it. The area comes with its challenges though – most notably the severance created by the Northwestern Motorway. With Unitec in the bottom-left corner and a light-rail station likely to be diagonally across both the motorway and Carrington Road, serious effort will be needed to ensure light-rail really can serve this development as well as unlocking Pt Chevalier as a whole. Looking more broadly around here there are multiple major development opportunities. An under-developed town centre, Unitec, a major publicly owned piece of land used for healthcare in what seems to be quite an inefficient way, a big carpark, big undeveloped sites just north of the motorway, old warehouses and more. Let’s add those to the mix, when we are thinking about how to connect the station with its surrounds. The most immediate need is to better connect the station with the area to the south of the motorway. One way to do this will be to link back together the two ends of Parr Road – a victim of when the motorway was carved through here in the late 1970s. The other thing to do will be to widen the Carrington Road bridge, as this can enable bus stops to be located close to the light-rail station. However, if we really want to overcome the severance and to unlock development potential of this area’s surrounds, we could use the natural contours through here (the motorway is below ground level, especially on the southern side) to cap it. 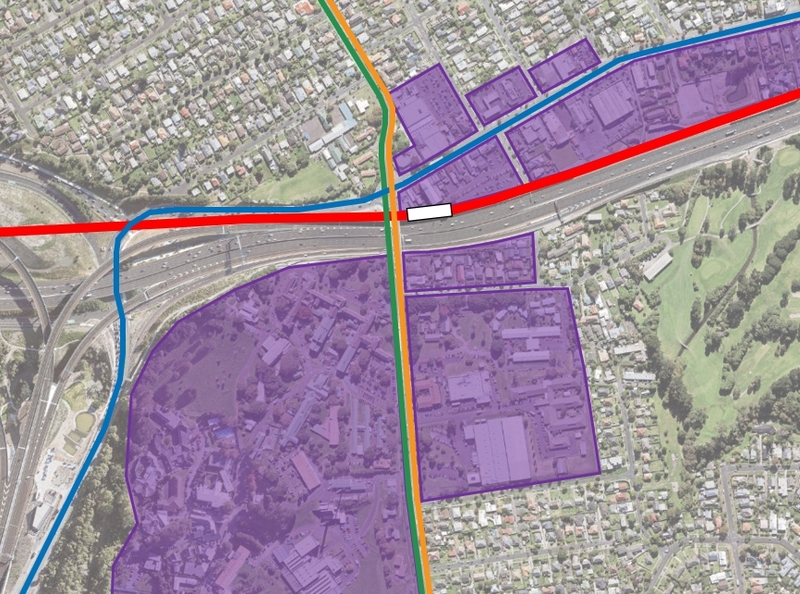 Extending the capping slightly west of Carrington Road would enable better links to Unitec. Some of it could be developed and other parts of it made available to add to the public space of in the area. Putting all of this together, you can see how hugely important this light-rail station could be. 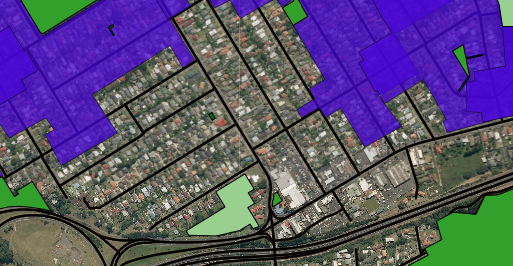 Alongside the 4000 new homes in Unitec, you could see how say half as many again might be provided in other redevelopment sites in close proximity to the station. Add that to the role of Pt Chevalier as an important bus connection point and you can see this being a very busy place. Realising this opportunity will be challenging. The capping might be expensive, some of the land I’ve highlighted as a redevelopment site may be difficult to unlock, squeezing light-rail efficiently and affordably through this area where there are already a myriad of ramps will also be tricky. On the other hand, Pt Chevalier is clearly a pretty attractive spot for people to live and it’s surprising there has not yet been much redevelopment (some apartment buildings are planned). 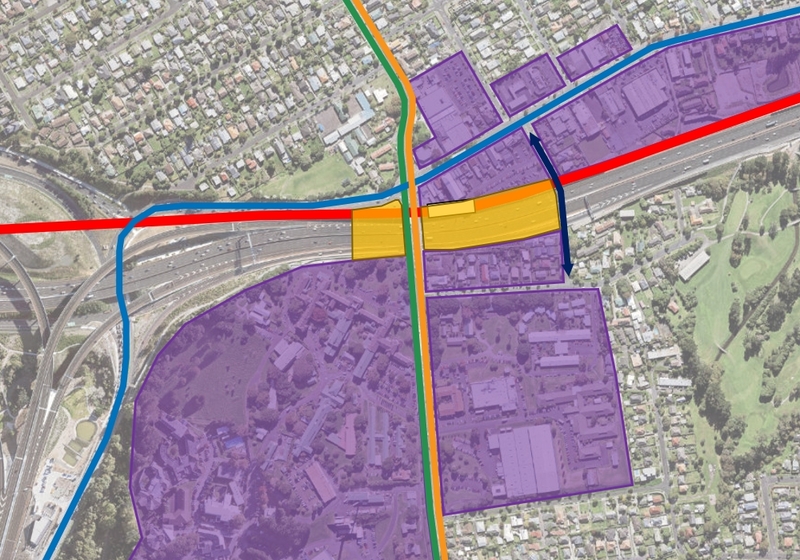 Furthermore, it would be incredibly stupid to build light-rail through Pt Chevalier and also do the large-scale redevelopment of the Unitec, but not properly connect them together. Let’s hope NZTA and the Council are getting their act together to realise this potential. I love the idea of capping the Motorway, it should be done around all train stations and town centres at least. Yeah me too – we should cap Spaghetti Junction and reconnect the city to its fringes – imagine K’ Road without that severance! I’d love to see a proper study on the viability of capping over parts of the motorway. It would be a great outcome but my guess is it would be extremely expensive and very difficult. – the ongoing costs of severance, which people are now putting dollar figures on. They are both bigger than, and more based in reality than, the travel time improvements that are used in business case analyses that caused the severance in the first place. – the public health and social health benefits of opening up Chamberlain Park to the new intensified area on GNR and opening up Pt Chev Town Centre to the new Unitec development. Capping will achieve connection far better than tinkering with a couple of bridges. I love the idea of capping the motorway here to follow the general contour of the land. Once the golf course is repurposed we should at least look at having another pedestrian/cycling overbridge on the eastern side of the station. Q: how would you connect citybound GNR services into this station location? In an ideal world that is. The bus bridge suggested by GA about four years ago perhaps? They’ll be connected by default, the bus stops on GNR are only 60m from the station location shown above. Ah, but you’d have to cross at the lights where pedestrians must wait 1.5 minutes at peak hour… already a problem for people transferring between the 18 (and other GNR routes) and the 66 or outer link. I have an idea. Let’s create a low ceiling, narrow underpasses with green flickering fluorescent lighting covered by metal grates. Based on Heidi’s chuckle I’m thinking this is some joke I don’t get, unless the joke is literally that this is a terrible idea in which case I do get it but it seems like there’s more to it. That being said, I quite like underpasses. Well, the uni ones anyway. Can be a little disorientating though due to the low ceiling and the light placements. The “with green flickering fluorescent lighting“ should of given it away. You obviously haven’t gone through the Glen Innes one especially at night, but yes the University one isn’t that bad. I safely designed modern one one would be OK. Perhaps if Great North Rd was restricted to general traffic more then more ped crossing priority could be implemented. LRT up through the gt nth Rd off ramp east bound could help restrict that. An underpass is inappropriate here. TOD means interaction of people and place, not efficient people-movement with no chance for engagement along the way. My chuckle had no *depth* in meaning 🙂 Grant’s description of a bad underpass simply resonated with experiences I’ve had. Just needed the puddles of urine and the wind blowing through to complete the picture. The Symonds St underpasses are much better but the ultimate solution there would have been attending to the problem of too much traffic. And students still largely cross at street level anyway because it is intuitive. There’s 60m and then there’s 60m in Auckland. People would have to cross at least one set of lights. Is there an option to take GNR buses in behind shops too so they can stop at same platforms as LRT? Better passenger experience etc. Yes I’ve wondered this, but would slow the 18 bus, take up too much space perhaps for bus turn around etc? Not sure if this would be good value. Probably quite a lot of works required to turn a bus of Great North Road and get it into the carpark area behind the shops (assume that’s what you had in mind) and out the other side. Thats a bit of a dog leg with a right hand turn across traffic required in each direction, which suggests you’d need to add in two new sets of traffic lights, which suggests the buses would often make extra stops at those traffic lights. So you’d be slowing down all the people on every No.18 bus, including those transferring and those not transferring. And also in doing so you are taking the bus stop away from the middle of the town centre and putting it to one side, which means anyone going to the shops now has to make the extra walk that you are trying to avoid for connecting passengers. How about 2-3 high-freq shuttle buses between Coyle Park and Mt Albert shops – loop at the ANZ. Also worth considering an LRT from Pt Chev, down Richardson Rd to Hillsborough then Onehunga and beyound. The 66 connects Coyle Park and Mt Albert Shops every 15 minutes – one of the great outcomes of the NN for Pt Chev and Mt Albert. Once the LR is there, it could be every 5 or 10 minutes. It also connects to the southern line and Onehunga line at Penrose. The bus stop locations and pedestrian amenity at each of these places are what will be critical. -light rail either in the middle of the motorway replacing lanes there, connected by elevators up to the capped area or to pedestrian overbridges OR LR next to the motorway at the upper land level, ie above the new GNR general traffic. Rerouting the general traffic away from the shops, with a few pedestrian overbridges, may do more to solve the severance issue than capping would, because we have severance by both the motorway and GNR. I strongly support re-connecting the two halves of Parr Road across the motorway – but absolutely not for vehicular traffic. I have been advocating for a pedestrian/cycling connection here for years but found no interest from NZTA – however, once there is a transport interchange at Point Chevalier (light rail x several bus routes) the logic of a crossing becomes much more compelling. The capping idea might be more of a long term concept but well worth pursuing – sale of development pods above the motorway would more than repay the cost of such a structure. However, the area west of Carrington is more problematic as the flying ramp from the tunnel (North-bound) connecting to SH16 (East-bound) is still descending at this point – while it was designed to fit under the Carrington Road Bridge, west of there it is still sloping down from its apex of about 30m asl (in order to clear the West-South ramp) down to about 22m all to fit under Carrington Road. I would modify your square cap to a more triangular shape – with the western side more or less along the axis of the heritage No. 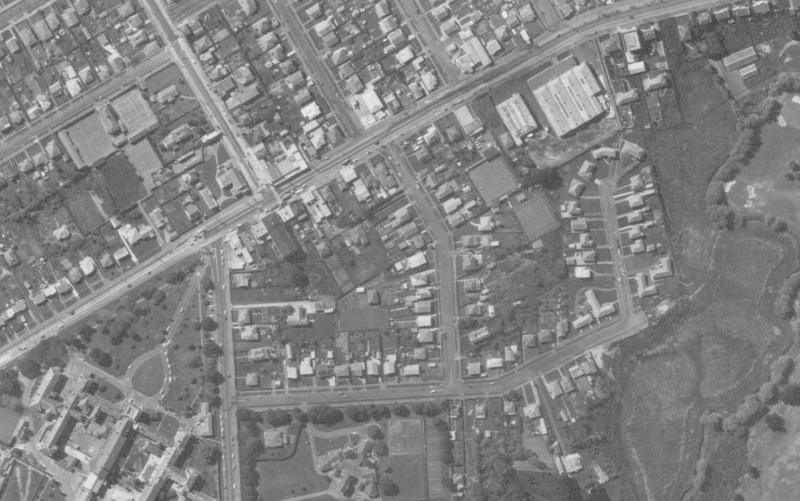 1 building (which is clearly visible in the lower diagram) – if you look at the historical (pre-motorway) aerial you can see that this was the alignment of the grand main entrance to the old hospital (formerly lunatic asylum) and would again make a very logical connection between the heritage building (which hopefully will become some kind of community facility) and the west end of the village centre. …that sure is old language there “lunatic asylum”. Interesting re the clearance there though,sure is a beast of an interchange there now. Sounds like a big opportunities for urban development near the light rail station that intercept the pt Point Chevalier town Center. I think 4 storeys or 18m is not dense enough to fully utilize the opportunities of this transport node. The last thing we want is developer building single level bulk retail strip with big car parks at front. Yes, quite! Already consented are some 6-storey developments. The property between St Francis and the corner will go to 6-storeys, with 62 apartments. And http://themeraki.co.nz/ (just west of the RSA development that Matt notes) will be 6 storeys, with 95+ apartments. At least it highlights that you won’t have to go far for liqueur. Ha! I hadn’t spotted that. We are already very well endowed with Bottle-O’s. Maybe I should add a new layer onto my placemaking maps showing all the alcohol outlets… :/ I recently realised it’s quite an excellent destination for op-shopping and for takeaways, in addition to the well-known thriving trendy bakery / cafe scene. It is one of the 3 essential services you find in any town centre: dairy, bottle store and real estate agent. Agree, should be like New Lynn and have 10+ level buildings. 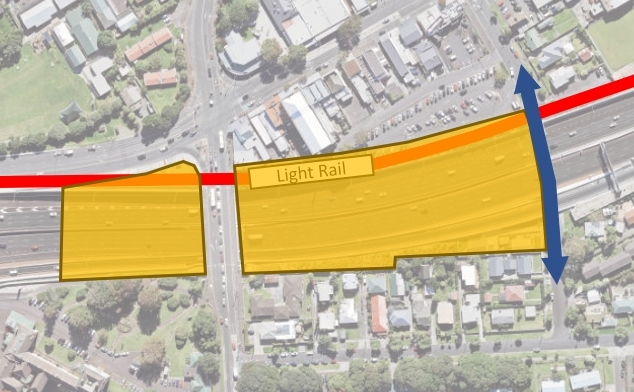 1) At what elevation will the light rail run (Above / At / Below ground level) across the causeway, through the interchange, past the shops, east of Pt Chev.? 2) The schools in the area are overcrowded. St Francis shouldn’t loose any more of its land. 3) There is no space between Gt Nth Rd and the motorway lanes to construct even columns for an LRT. 4) An LRT could be built to go under the tunnel to city ramp, then on columns elevated above where it merges and above the Carrington Rd bridge. their plans. There is trees, cycleways, Gt Nrth Rd, Motorway or something that has to give. Thanks for the post, Matt. It’s a subject dear to my heart, as you’ll know. I LOVE the top picture, showing the LR down the middle of the motorway… 🙂 Doing this would improve people flow while creating traffic evaporation, with all the social and environmental benefits that this would bring, and serve the goals of our Low Carbon Strategic Action Plan in a way that the other routes do not. It would also better serve the goals of the Government Policy Statement on Transport. But if it’s as impractical as you think, what else could be done to produce the traffic evaporation at the same time as increasing the people-flow? Great post & discussion. Yes this could be done really well around here to improve things. 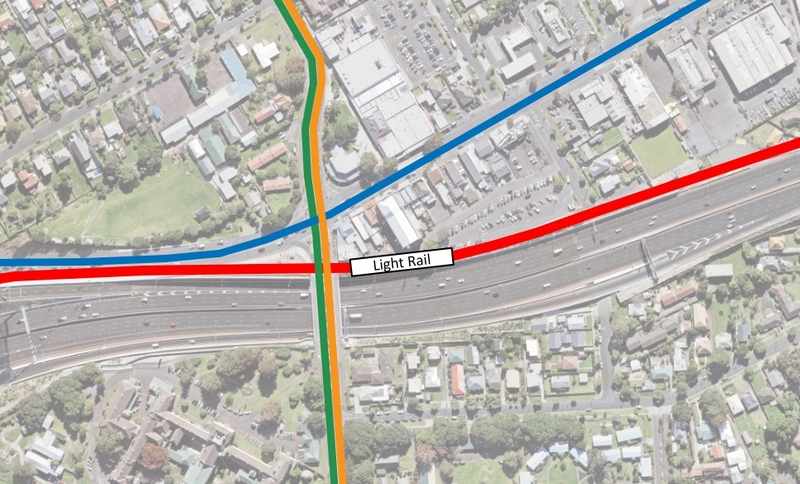 I’d think that past Carington rd overbrige it it woud start keeping level with the SH20->SH16 citybound, jumped over GNR than along the SH16 -> Pt Chev offramp and over the SH16 to land on the “inside of the causeway or in the middle of the motorway there. In any case – massive. the 4 storey height limit seems a bit silly now in the context of a potential light rail station – especially if you are to consider opportunities provided by capping the motorway. I presume that in looking to help fund the line (land value capture, in-kind works etc) NZTA (and the proposed UDA) should be looking to scale up densities – 6 to 8 storeys could work quite well in this area around GNR with a few taller elements perhaps to take advantage of this coastal location. Capping wouldn’t be all that difficult, because it would be very similar to the cut and cover construction techniques we have seen with the Victoria Park tunnel, Kirkbride Road bridge and now the ends of the Central Rail Link. Our engineers and contractors have got very good at it and the manufacturing facilities to make the concrete beams required already exist at Ormiston. I think this is something they should also do for Neilson St in Onehunga. Instead of the EWL plan they had. Cut and cover Neilson St. I think it’s really the only way to increase the handling capacity of the junction. If it helps fund the purchasing of property to provide the necessary active mode pathways and the small recreational facilities and intensified Pt Chev requires, plus the moving of utilities so that Pt Chev’s streets can have trees planted and it can lose that ugly barren look, then I’d be in support of higher levels too. The four storey limit makes a lot of sense, but then so do these other amenities. If you do it properly you can get a lot of density already with 4 storeys. Of course, not if we keep botching around with setbacks and shading and outlook rules etc. Headline: Chamberlain Park to be the second golf course (after AF Thomas Park) served by rapid transit.